The Savory Spice Shop was the overall winner of the 2013 Princeton Salsa Slam. Masala Grill was the People’s Choice winner in the 2013 Princeton Salsa Slam. The Salsa Slam judges debate the merits of each entry. 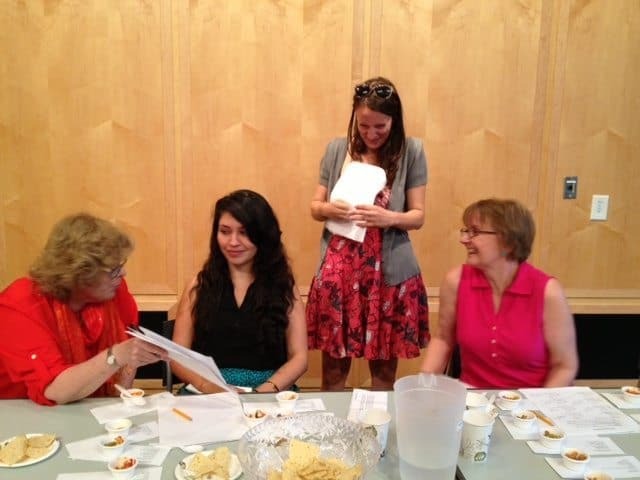 Hot, mild, fruity, zesty — the entries in the second annual Salsa Slam at the Princeton Public Library tonight ranged from traditional recipes to creations with a twist that included watermelon, raisins and a tandoori-inspired salsa. Ten local restaurants competed for the title of Salsa Slam champ. The overall winner, selected by a panel of four judges, was the Savory Spice Shop on Spring Street. Masala Grill was the first runner up, and Mediterra was the second runner up. About 50 people sampled the salsas and voted for the People’s Choice award, which went to Masala Grill. The People’s Choice runner up was Mediterra. Before and after the judging, visitors enjoyed dancing (salsa, of course) on Hinds Plaza with the Central Jersey Dancers. The Central Jersey Dancers taught people their moves. Enjoying some salsa on Hinds Plaza.